Parasite of the Day: Uncinaria sp. Hookworms are long, skinny gut-dwelling vampires, and there are about 500 million people around the world who are infected with these parasitic roundworms. Hookworm infections cause chronic blood loss and iron deficiencies, which can lead to anemia, lethargy, and hinder childhood development. But it's not just humans who are afflicted by hookworms, there are 68 different described hookworm species and they infect over a hundred different species of mammals from around the world. The life cycle of the typical hookworm is fairly straightforward. Hookworm larvae are hatched from eggs that are deposited in the environment with the host's faeces. When the larval parasite hatches from the egg, it spends about a week developing in the soil and can survive for 3-4 weeks while waiting for a host. If it encounters an appropriate host, the parasite burrow through the host's skin, then take a journey around the body via the blood vessels, through the heart and lungs, and eventually settling down in the intestine where it matures into an adult worm. Much like the human-infecting species, those other wildlife-infecting hookworms can cause chronic illness from their blood-feeding. Additionally, the host is constantly exposed to new infections from other infected hosts in the area. While these parasites can be a debilitating burden on the host, hookworms by themselves aren't usually known to cause host death. But the fur seal hookworm - Uncinaria - breaks that mould. 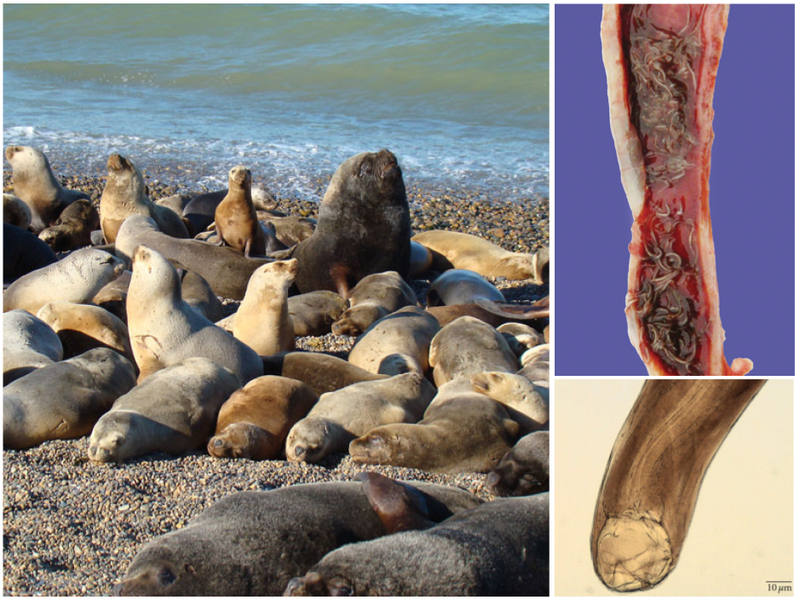 The adult worm lives in the gut of seal pups, and unlike other hookworms that have a lifespan of at least a year or more, the adult stage of Uncinaria doesn't live that long - most seal pups are free of the hookworms within a month or two after the initial infection. But during that time, Uncinaria takes a massive toll on its host and it is one of the leading causes of pup mortality, responsible for 30-70% of pup deaths during breeding seasons. One of the reason for their lethality is their aggressive feeding habit. Unlike other hookworms which are content to simply hang on to the intestinal wall and steadily sip blood, Uncinaria is a glutton that digs deep into the intestinal wall to get their fill and churn out as many eggs as possible during its short life. Their motto is "live fast, die young, leave a whole lot of eggs". Along with with its short lifespan and unusually aggressive feeding habit, Uncinaria also differs from other hookworm in having a very convoluted life cycle. 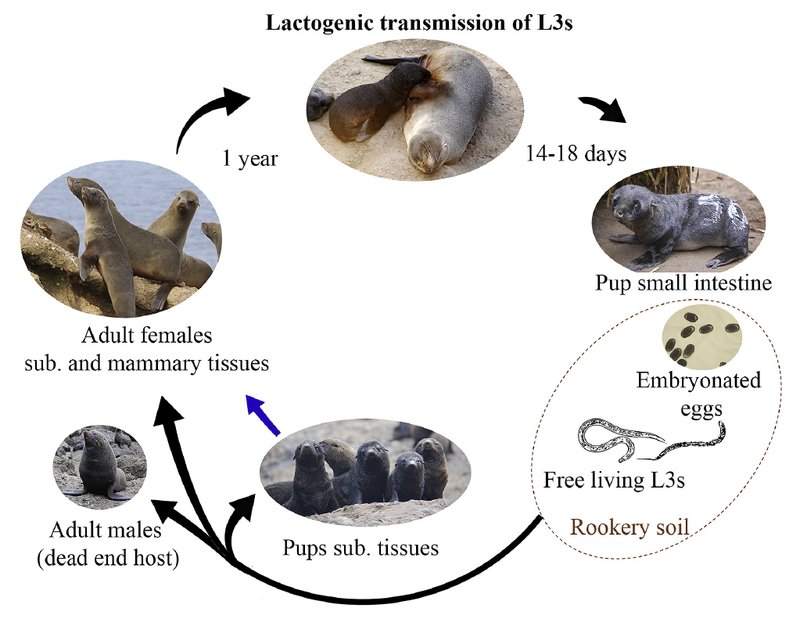 Unlike human hookworms, seal pups do not acquire their infection from hookworm larvae in the surrounding environment - instead they get it directly from their mother's milk. Once Uncinaria enters the seal pup's gut, it mature into an adult worm within two weeks and starts producing eggs that are shed from infected pups and get spread all over the rookery grounds. After hatching, the hookworm larvae burrow into any seals that they encounter, and migrate to the belly blubber. Once there, instead of developing any further, the parasite lay dormant until the next breeding season - when that eventually comes around, the Uncinaria larvae in female seals make their way to the mammary glands where they can be on stand-by to infect the next generation of seal pups. As for the adult male seals? Because the transmission cycle relies upon the mother's milk, male seals are effectively a dead end host for this parasite. So why has Uncinaria evolved to live the way that it does? Well, unlike land-dwelling mammals which can deposit hookworm eggs into the soil for many years and get repeated exposed to new hookworm larvae from their surroundings, Uncinaria does not have those luxuries. Its hosts spend most of their time out at sea and when they do come onto land, they only do so temporarily. The breeding season is the only time when new hosts are around on land for long enough and congregating in sufficient numbers for the parasites to disperse and infect new hosts. Uncinaria only has that brief window of opportunity to complete its life cycle, and to do so successfully means it need to saturate the rookery soil with eggs. And the cost for all those eggs are paid for with the blood of seal pups. There are a wide range of different factors that determine how harmful a parasite or pathogen is to towards its host. In contrary to popular misconception (or wishful thinking), a well-adapted and successful parasite is not necessarily one that has evolved to live harmoniously with its host, but one that has evolved to get the most out of its host. And under some circumstances, it might mean that the road to successful life cycle completion is one which is paved with dead hosts.